Beautiful furnishings I saw at market. Market comes but twice a year – typically spring and fall. For those of you that don’t know what I mean when I say ‘market’, it is when trade-only design centers show their newest product and put on educational seminars for design professionals. This is where interior designers can see new trends, expand their knowledge, and get inspired. Interior designers in Southern Californians are a little spoiled, as we have access to some of the largest and best design centers in America. While I spent most of my short time at market this year in seminars, I was able to snap a few iPhone shots of some of the beautiful things that we, as design professionals, have access to, to create gorgeous unique designs for our clients. 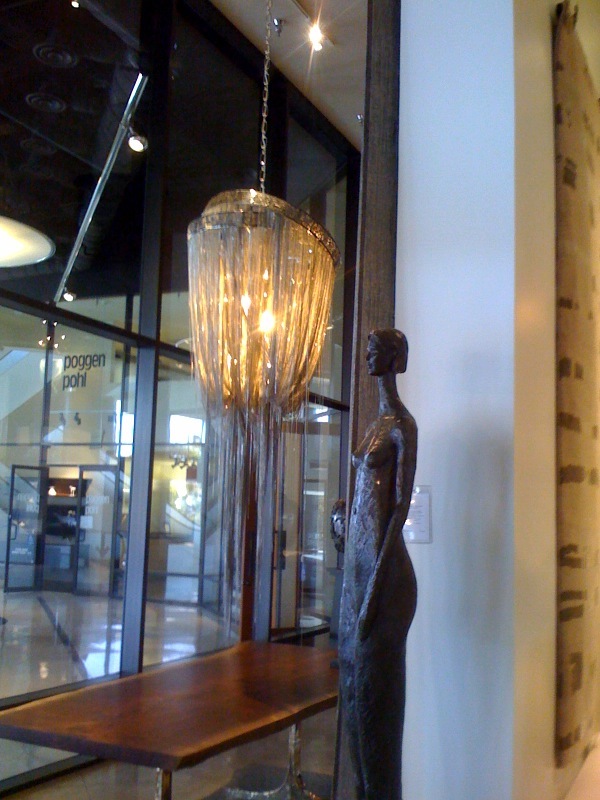 Wow, this chandelier (Fantastic Glam Chandelier and Bronze Sculpture – 2010 Market) – what a statement this would make in someones home. Thin chains hung from oval bands of dye-cut metal, drape luxuriously around the light source, creating amazing light and shadow patterns on the surrounding walls. 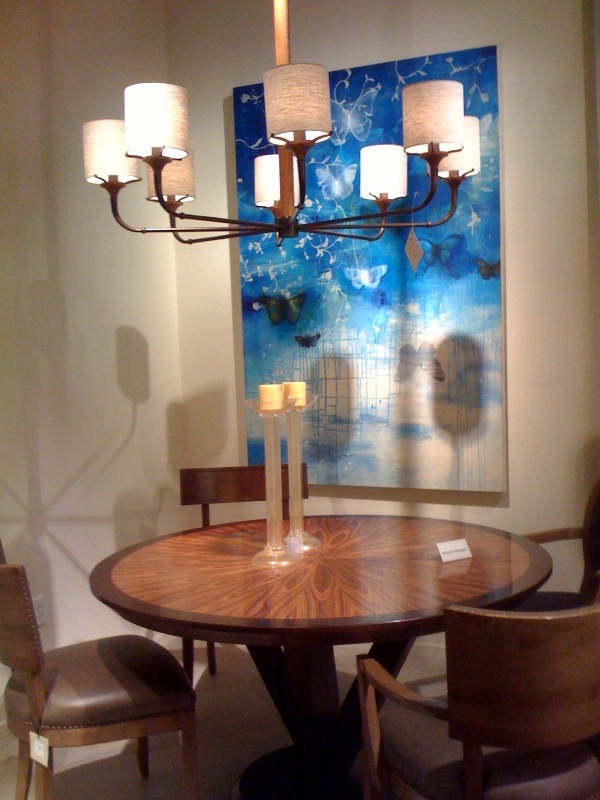 The juxtaposition of this glam fixture paired with this organic edged walnut table with hammered metal legs is where design is headed. Mixing and matching vs. matchy matchy is the new way to go. This living room is a classic beauty with clean lines, warm neutral coloring and easy style would look great in many homes. 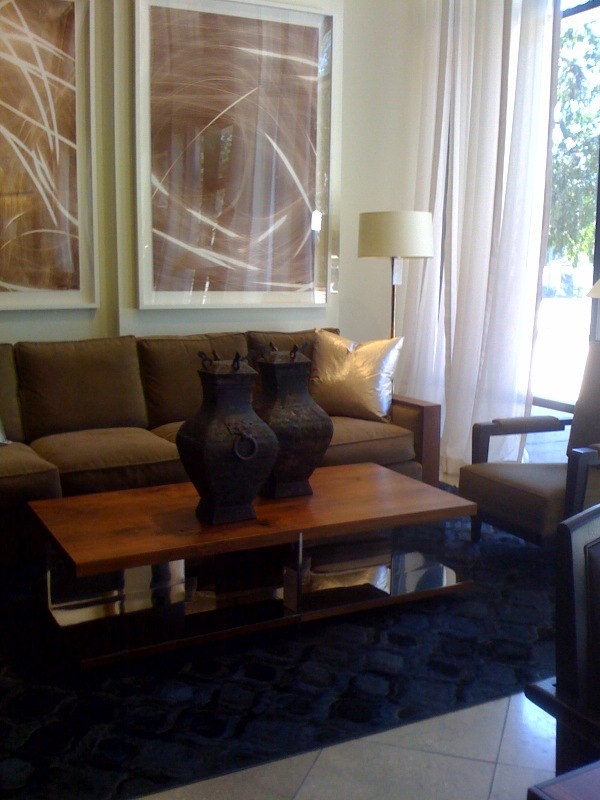 While the furnishings are of the highest quality and look picture perfect, what’s really cool here is the rug. I’ve included a close up of the rug in picture #3- [Detail of Rug from Eclectic Living Room – 2010 Market], the texture, warmth and intrigue this rug adds to the room is priceless. While this photo [Traditional Dining Set – 2010 Market] isn’t super clear, don’t overlook the stunning turning on this inlay dining room table leg. 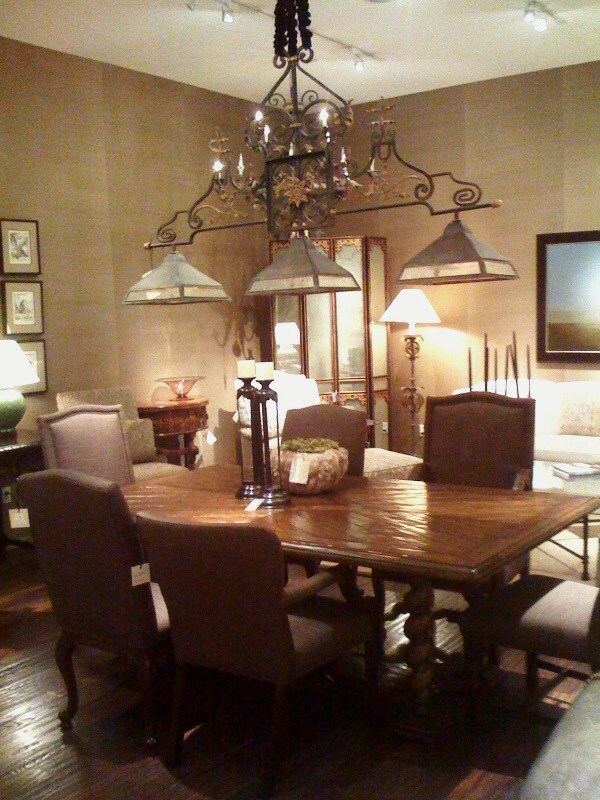 Plus, this 3 light chandelier is amazing for the traditionalist. This final photo is a quaint little dining vignette with great art which makes the space pop.